$2,000 Fine For Hunting Without A Licence. A Massey-area man has been fined $2,000 for hunting without a licence. Jeffrey D. Minten pleaded guilty to a charge of hunting big game without a licence. In addition to the fine, his hunting licence was suspended for one year. Two other charges related to this incident were withdrawn. The court heard that on November 12, 2012, a Ministry of Natural Resources conservation officer responded to a complaint and found Minten in possession of two antlerless white-tailed deer. Upon investigation, it was found that Minten did not possess a valid 2012 licence to hunt deer. Justice of the Peace Darlene Hayden heard the case in the Ontario Court of Justice, Espanola, on January 10, 2013. 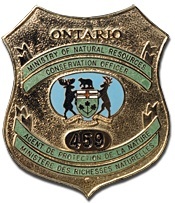 .To report a natural resources violation, call 1-877-TIPS-MNR (847-7667) toll-free any time or contact your local ministry office during regular business hours.